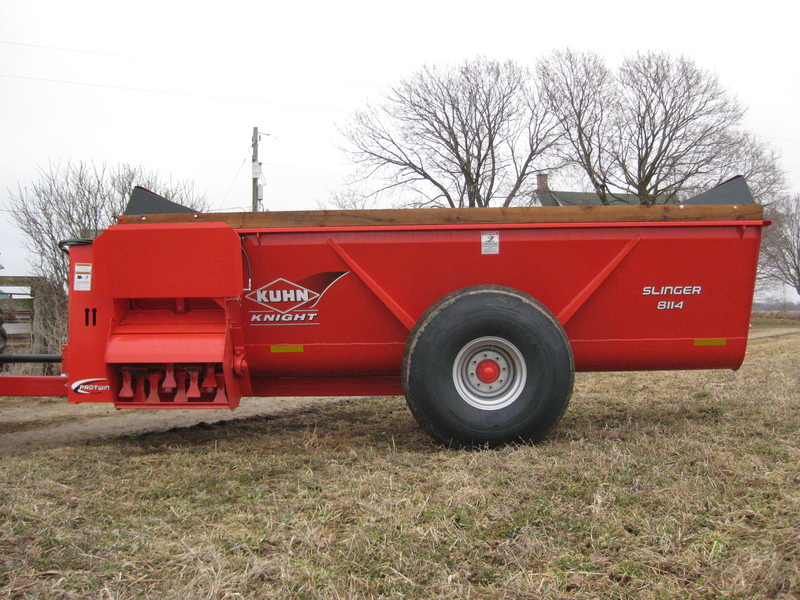 We purchased a new manure spreader from Studer Super Service. It’s a Kuhn/Knight Slinger 8114. It’s basically the newer model of our twenty-year-old spreader we junked this winter. I want this one to last twenty years. We paid $14,500 for it. 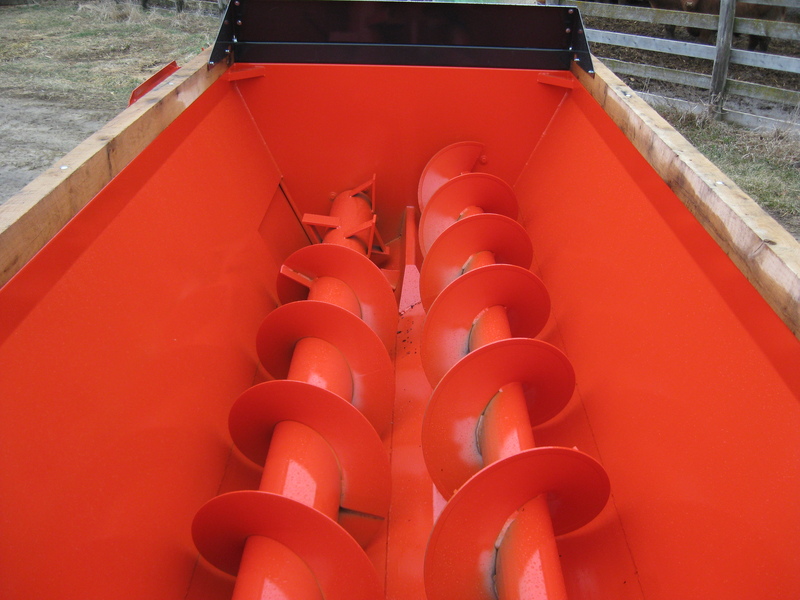 The auger on the right moves the material backwards as the auger on the left moves the material frontwards and to the side-unloading door. The beaters, pictured below, sling the manure into the field. I’m excited to use it. We have two hoop buildings to clean out, and several hay feeding areas. I want to cover the corn fields with a light layer of manure before corn planting. April is going to turn into May, fast. This entry was posted on Friday, April 8th, 2011 at 11:19 am and is filed under Curious livestock costs, Curious machinery. You can follow any responses to this entry through the RSS 2.0 feed. You can leave a response, or trackback from your own site. The manure sure is getting thick, maybe you could take it over to Waukesha county. They have plenty over there. 14,000 …wow. Farming can be sooo expensive. Hope the earth is thawing and you can get into the fields at the right time. We have had tons of rain in N. California…I think Spring is finally here. I’m ready for the sun! 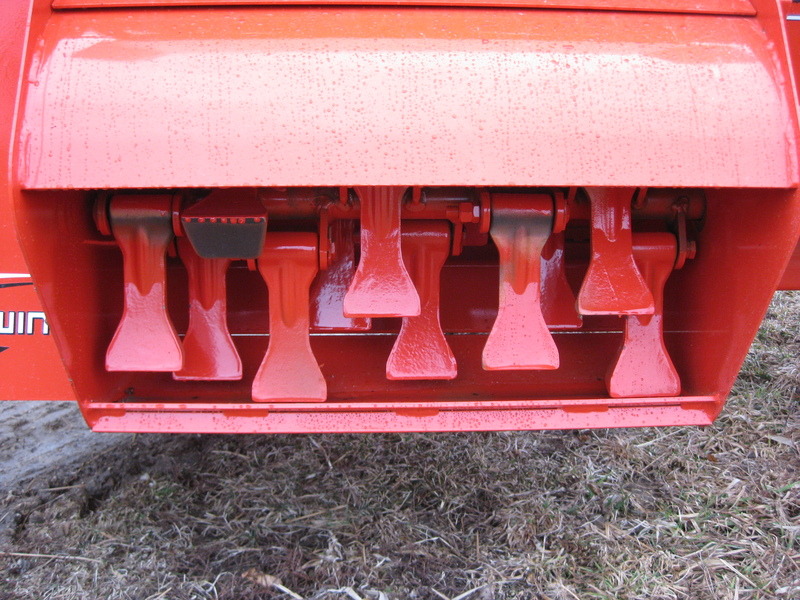 How do you like these slinger spreaders over the usual apron driven ones? from what I can gather these chop the material up better and spread more evenly, do you notice the same? I’m really enjoying this slinger. It does a much better job than our older apron driven spreader and better than our old slinger. One improvement is having two augers instead of one. Bedding packs had a difficult time feeding out of our old slinger. The other improvement is the large metal plate than can be raised or lowered over the beaters to determine the length of spread. When I look at the price of fertilizers, spreading manure has become one of the most lucrative jobs on the farm! Congratulations for your new manure spreader. Hope it can serve you well.